Our bifold door range is made up of three distinct aluminium systems from Origin, Schüco, and Smart. Each combine a beautifully modern style with their own unique set of advantages be it flush frames, sleek sightlines, or large openings. All three systems are leaders in their field, sure to have something of value to almost every homeowner preference. Bifold doors work by effortlessly sliding to any chosen side, neatly stacking alongside one another concertina style to help homeowners enjoy the best function and make the best use of space. All of our bifolds slide along their corresponding track with the easiest push, providing outside access at just a moment’s notice. Even in the smallest or most quaint of homes, bifold doors offer the potential to give the impression of an extended space, largely due to their vast opening widths when compared to other patio door styles. Rather than feel obstructed, once installed a new set of bifold doors will let the room flow into the corresponding outside space. Boasting some of the slimmest profile and sleekest sightlines found on the market, this results in more natural light being able to enter the home. These features also allow homeowners to enjoy maximum outside visibility to without ever disrupting strength or aesthetics. You’ll feel much closer to the garden as a result, all without leaving the warmth of the inside. Each one of our bifold doors can be powder coated with a matt of glossy colour finish to help make them stand out and make a lasting impression. While aluminium bifolds are typically supplied in grey or silver as standard, many homeowners use this blank canvas as a method of being creative and colour their doors in a shade that compliments the existing character of their home. Despite offering incredibly easy and effortless access, bifold doors remain very secure and as such are widely used in both domestic and commercial environments. Panels can be fitted to remain weather and watertight, with multi-point locking integration as standard so as to ward off any potential intruders and let homeowners enjoy peace of mind. Although highly technical, intricate, and innovative, aluminium bifold doors are incredibly easy to maintain in order to stay functional and attractive. They will stay looking good for many years to come, only requiring the occasional wipe down should ever they become dirtied with dust. Particularly useful for those residing alongside built-up residential areas, our bifold doors make use of multi-chambered internal profiles which effectively trap sound and filter it – soundproofing. This method also helps to better retain heat, keeping the living space a lot warmer than before to reduce energy bills and render the space thermally efficient with ultra low U-Values. 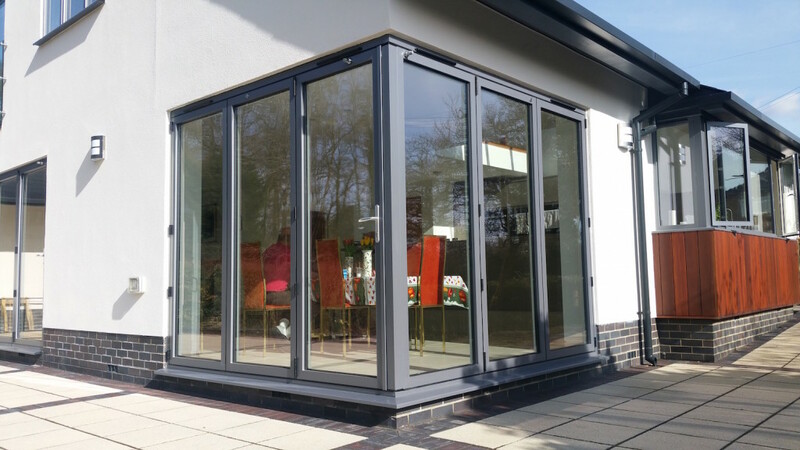 Ensuring easy transitions both inside and outside the home for those that typically struggle with certain aspects of mobility, we can install aluminium bifold doors with nearly flush thresholds. This means less effort is needed as you pass through the system, an element and feature of great value to both wheelchair users and parents with push chairs and buggies. A centrepiece and product of note within any home they’re installed, bifold doors are always an appreciated feature and as such can even increase the overall value of a property should you plan to sell and relocate. Similar to how conservatories can influence momentary and resale house prices, bifold doors too act as a sound investment. By and large, bifold doors are quickly becoming a must-have within many British homes as opposed to the option they have traditional been during the last couple years. Offering a plethora of advantages from improved energy efficiency to an unrivalled impression of more space, the 10 reasons we have covered are just the tip of the ice berg. Want to know more about DWL’s bifold doors, other products, and additional services? Feel free to call our team today on 01795 383 688 or contact us online.